Femtosecond lasers have opened up new avenues in materials processing due to their unique characteristics of ultrashort pulse widths and extremely high peak intensities. One of the most important features of femtosecond laser processing is that a femtosecond laser beam can induce strong absorption in even transparent materials due to nonlinear multiphoton absorption. Multiphoton absorption enables both surface and internal three-dimensional modification and microfabrication of transparent materials such as glasses. This makes it possible to directly fabricate three-dimensional microfluidic, micromechanic, microelectronic, and micro-optical components in glass. These microcomponents can be easily integrated in a single glass microchip by a simple procedure using a femtosecond laser. Thus, femtosecond laser processing has several advantages over conventional methods such as traditional semiconductor processing or soft lithography for fabricating microfluidic, optofluidic, and lab-on-a-chip devices. Consequently, this topic is currently being intensively studied. 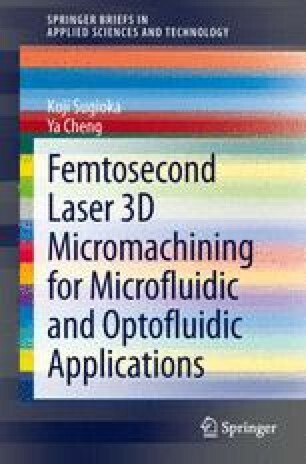 This book gives a comprehensive review of the state of the art and future prospects of femtosecond laser processing for fabricating devices such as biomicrochips.